Your Guest Will Be “Green” With Envy The Greens At Centennial Campus. Some of you may be settling into your new home while others may be looking to switch things up. Whatever the case may be, we have something for everyone! Below are a few “green” ways to liven up your apartment abode. A much-loved way to decorate: plants & flowers. Not only are they visually appealing, but they have multiple benefits, too. (Not to mention, there is a psychology behind it!) Adding nature to your décor, especially anything green, brings in tranquility & calmness. Something anyone would want, particularly after a long day! Consequently, this way of design is inexpensive way to brighten up your space while bringing warmth & an inviting feel to your place. It also improves the air quality within your apartment. Check out local nurseries or our local Farmer’s Market for this. Don’t forget about yard sales, too! On breezier days – you can make a day of hunting for cool pieces with friends while also helping out NC neighbors. Lastly, artwork – it doesn’t have to be expensive & it’s a terrific way to be creative & express your style. 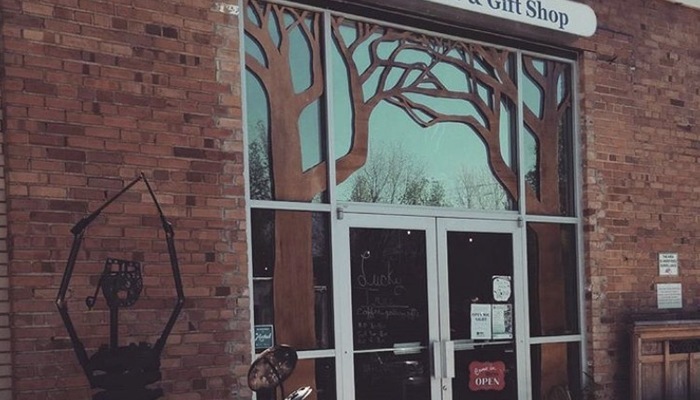 Not to mention, you can probably find local artists to support like at The Lucky Tree Café in Raleigh! It’s a hip, eclectic coffee shop to grab a treat & a drink, but what’s even cooler is that they use local artwork to adorn their space, which is also available to purchase. They have a variety of art including canvases, jewelry, sculptures & apparel. What’s your favorite “green” way to decorate? Feel free to share with us some of your ideas – we’d love to hear them!